In contrast to bookings for planned trips, the entries in the tour log are intended as a protocol for performed rides. Bookings are the source of invoice. For entries in the tour book you can create receipts but no invoices. If these details are completed, no error message will appear when saving the drive by clicking the ‚Done‘ button. It is possible to save the trip even with incomplete data. In contrast to a booking, the entries in the tour book are anonymous, i. you do not have to enter a name of the guest. If you want to change a tour later, the drive is initially read-only. Click on the icon . the write protection is switched off. The pickup time is entered in a menu. An entry in the calendar as in driving orders does not occur. You can enter names (eg airport) as well as complete addresses in the text field. Pressing the appropriate button will bring up a selection of targets that are used frequently. If you click on a destination, the address will be copied into the tour. 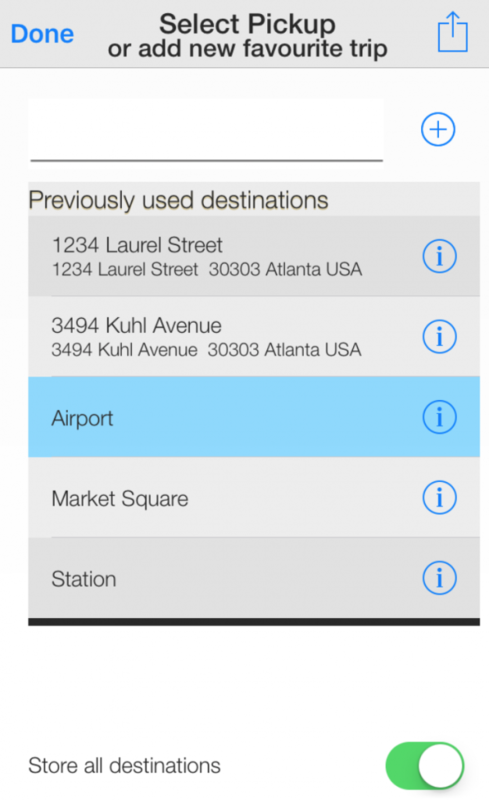 In the example, all destinations entered as the destination or pickup location are transferred to the frequently used location drop-down menu. If you press the button, you can search on a map for the exact location. If the number of fields is insufficient or if not all the information fits in the comment field, additional fields can be added. Press the additional field ( ) button next to the comment field. Dieser Eintrag wurde veröffentlicht in Taxi Data Manager english und verschlagwortet mit destination, log, pickup, tour, Tourlog . Lesezeichen auf den Permanentlink.